Cooking is a retreat and an activity which I thoroughly enjoy! However after a long day at work, spending an hour preparing a meal isn't always feasible. At least for me, most days it's not. Lately by the time I get home I'm starved and ready to eat! So there is always the ever enjoyable take-out (sushi and mexican are my absolute favs!) however that isn't the best on the wallet nor waistline if done too often. So during the week I use the help of my local grocery stores for assistance in making a simple meal taste 10 times better than a sandwich or bowl of cereal! Here is a recent tasty meal I whipped up! And it all started with a salad dressing! It literally jumped out of the cooler at me! Summer in a bottle while still in winter, much? Totes obvious right?!!! I concur! 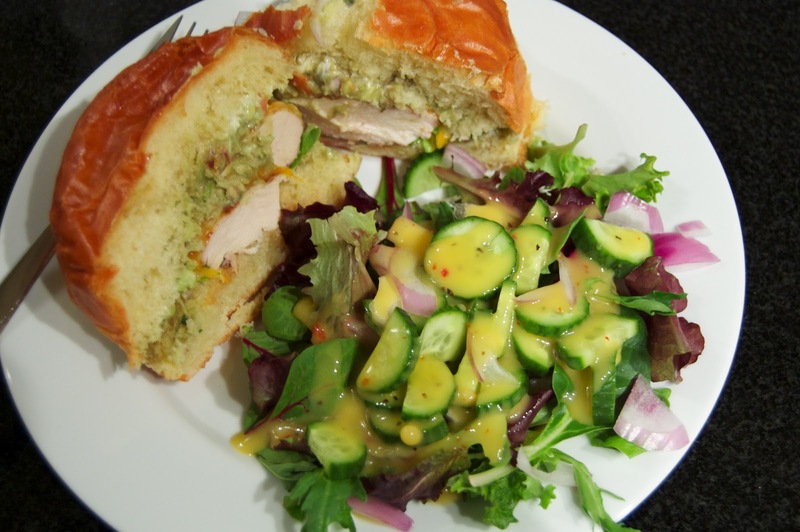 I used the dressing to marinate chicken breasts - For a grilled chicken sandwich and a side salad. I threw the breasts in a tupperware and covered with dressing before I left for work - and then let the dressing do it's thang! Then after work it was all easy-peasy! I grilled the breast (yes, I fired up the BBQ in dead of winter - hey ask the Hubs I'm grill master!). When it was done I added a slice of cheese, lettuce, onion and a bit of guac - bc the guac was hanging out in the fridge begging to be added! While the chicken was cooking I prepped a simple salad - pre-pack salad just added fresh chopped red onion and cucumbers. Dressing then, voila!!! It probably took me 20 minutes start to eat - not too shabby and it was delish! Do you have an simple go to week night meals??? Please share! I have the stuffed shells recipe to share too - I just need to upload the rest of the photos!!!! They were so fun to make and equally as delicious to eat! 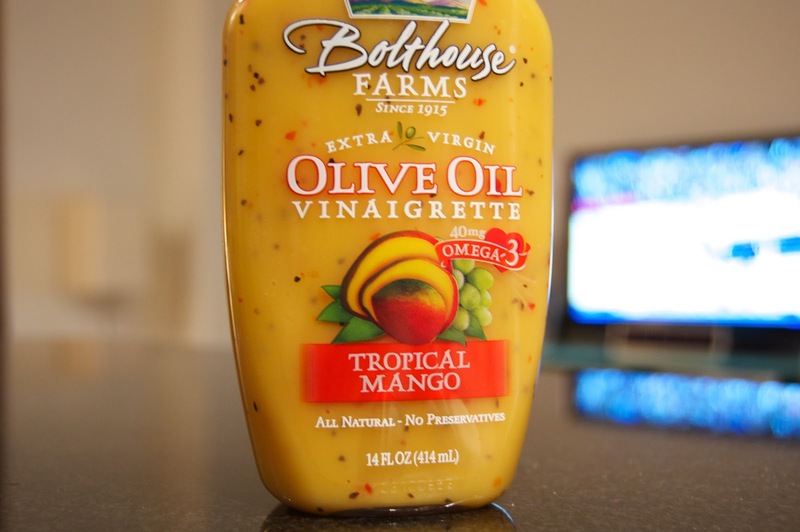 i love marinating with salad dressing! it's so easy. my favorite lately has been newman's own greek dressing with shrimp or chicken. i also like stuffed chicken breast with a combo of spinach & feta OR spinach and garlic and herb boursin cheese. just slice the chicken breast in half, stuff it, and throw it in the oven to bake through (or on the stove top if you want). easy, healthy, and delicious! oh my goodness this sounds fabulous!!! I am so with you on that....by the time I get home I want dinner to be ready and in front of me (clearly doesn't happen) cause i starve! This sounds so easy and so yummy. Our "go to" weeknight meals are stir fry, turkey meatballs w/salad, and taco salads. Now I'm hungry! That looks so delicious! I'm new to the whole cooking thing, but skinnytaste.com has really given me some inspiration to go forth and conquer. And, believe me, that is no easy feat for this domestically-challenged lady! that dressing looks and sounds delicious! This looks amazing!!! I'm totally drooling and I'm going to try this. Thanks for this post. I'm always in need of quick meals, so I hope you post more! Taylor this looks so freaking good. I need to plan ahead more - this one is going on my list. The salad looks rad and I have bread I can use. Thanks so much!! Let's just say I've had 500 too many tacos this winter and my waistline is feeling the effects. Not attractive. ps-my go to quick and easy is a turkey burger. in the turkey i put chopped up serranos and white onion + a little sriracha, pepper, salt and garlic. usually wrap protein style. it is so good and really quick. i love pasta as a quick meal...i know probably not the best for you but i seriously can't get enough. love to throw in a ton of veggies to make it semi healthy. love your summer in a bottle! YUM! Yes. I am always making home made black bean veggie burgers (SO healthy), veggie soup, lentil soup, and veggie chili. that looks SO good!! and is that a hawaiian roll?! yes please. yum that salad looks delish!!! i just did a post on simple healthy meals i make during the week.